Hooray and congratulations to endurance swimmer Diana Nyad, who today achieved her life-long dream and a place in the history books by becoming the first person ever to swim without a shark cage from Havana, Cuba, to Key West, Florida. It took her 53 hours to cross 110 miles of open ocean against stinging jellyfish, strong currents, sun and wind, and her own 64-year-old body. 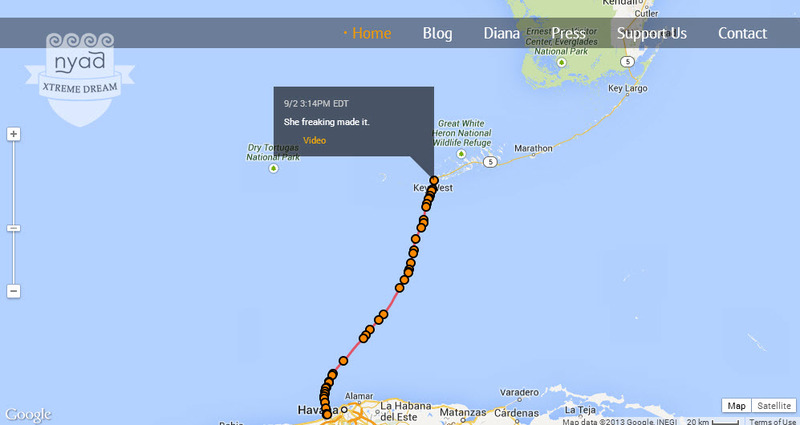 Diana Nyad’s route from shore to shore, from her website. In fact, upon her arrival on the Florida beach, she looked pretty close to death. Clearly this crossing took everything she had. I have three messages. One is, we should never, ever give up. Two is, you’re never too old to chase your dreams. And three is, it looks like a solitary sport but it’s a team. At an age when most people are ready to retire, Nyad has zealously pressed on in pursuit of her dreams while at the same time always encouraging others to pursue theirs. She’s a shining example of determination, courage, commitment and perseverance against all odds. She told the Los Angeles Times in 2011, “I don’t want to reach the end of my life and regret not having given my days everything in me to make them worthwhile.” One hopes she now can look back on her days and say yes, they were worthwhile. But I wouldn’t count her out to go chasing some other record just as soon as she recovers from this one. ONWARD! This entry was posted in Current Events, Inspiration, Video and tagged cuba to florida, diana nyad, dreams, swimming by Lisa Shaw. Bookmark the permalink. I am so happy for her! That is true determination. I was just thinking, I can’t even swim across a pool (never could) but this person, the same age as I am, swam this incredibly difficult journey. Wow!! Well, she HAS been working toward it all her life, practically. 😉 But yes, very inspirational.